It has to be said, the expectations for another Neil Gaiman-penned episode of Doctor Who have been exceptionally high. I think the pressure to perform, certainly after the award winning success of the very popular The Doctor's Wife nearly two years ago, can be detected in the interview with Gaiman in this week's Radio Times. He confesses "It has a few little scary bits" and, judging it on marks out of ten, "It’s running at about a five or a six. I’d love to do a nine. I’d love to do something that sends adults behind the sofa, too." Well, about five or six is an apt summation of Nightmare in Silver's remit to make the Cybermen, last seen skulking beneath a department store threatening James Corden's baby, properly scary again. Being a Neil Gaiman script there is, however, more to Nightmare in Silver than vicarious scares and not only does the story tap into the ever-evolving history of the Cybermen and the accompanying anxieties about a posthuman future where potentially our biology is transformed by artificial intelligence and wearable or implanted technologies, but it also explores the Romantic legacy of the stories of E.T.A Hoffman and Shelley's Frankenstein, musing on the responsibilities that come with the use of power, self-sacrifice and chess strategies. 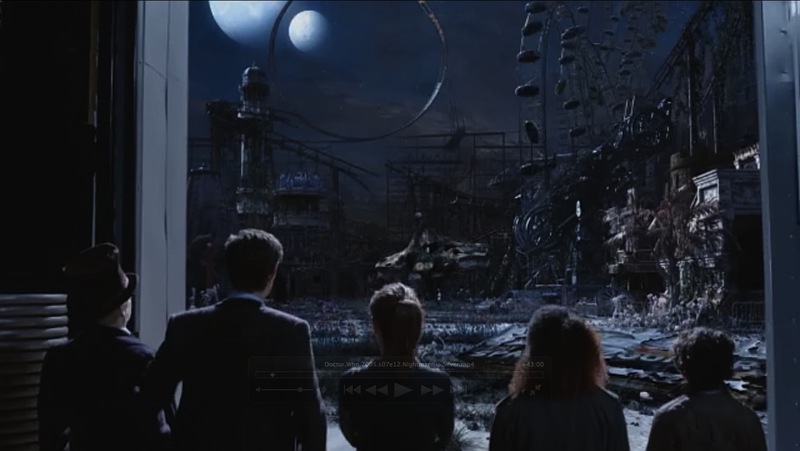 Nightmare in Silver finds the Doctor, Clara and her charges Artie (Kassius Carey Johnson) and Angie (Eve de Leon Allen) arriving on Hedgewick's World, an abandoned and dilapidated amusement park. Like Charlie desperate to use his golden ticket to gain access to the Chocolate Factory, the Doctor forlornly hopes his own golden ticket will at least get Artie and Angie a turn on the Spacey Zoomer. Never mind, that ticket does come in handy later. Hedgewick's World is definitely Gaiman territory, a strange dream space where the moon isn't the moon, they accept sandwiches as currency and the Dickensian, down at heel impressario figure of Webley (a rather underused but brilliant Jason Watkins) offers to frighten the children with his collection of nightmarish creatures and forgotten emperors. All the while, it's a question of what's real, what's counterfeit and who is manipulating darker impulses beneath the veneer of entertainment. It's a nostalgic call back which operates on several levels: a world of play, of innocent fun in the shadow of a centuries-old war and a yearning for a much older culture, of the Victorian fairground or the freak show which captured the imagination of the newly industrialised world, where you often pondered if the mermaid or the bearded woman was real or fake. In this dusty old playground, the misfits thrive. A platoon of army rejects go through the motions in a dusty museum on a planet closed by Imperial order. The Emperor has gone missing and the Great Exhibition is long over. No free ice cream today. Webley's World of Wonders is deceptive, for beneath the 'miracles, marvels and wonders' waits a long dormant but patient evil. 'Anyone here play chess?' asks the effusive Webley. A look of disappointment plays across the Doctor's face when Artie is invited to a demonstration of 'the wonder of the age and the miracle of modernity' as the tatty showman whisks off a dusty covering and reveals a clapped out Cyberman. Gaiman turns the Cybermen into a myth again, eschewing the alternative universe origin of the Cybus-men for a post-Cyber War history which saw their plan for conquest defeated by an alliance a thousand years ago, tapping into the series' history via 1975's Revenge of the Cybermen - 'You've no home planet, no influence, nothing! You're just a pathetic bunch of tin soldiers skulking around the galaxy in an ancient spaceship!' - and transforming their sad remains into the 699th Wonder of the Universe, as seen 'destroying you at chess' in the Imperial court. 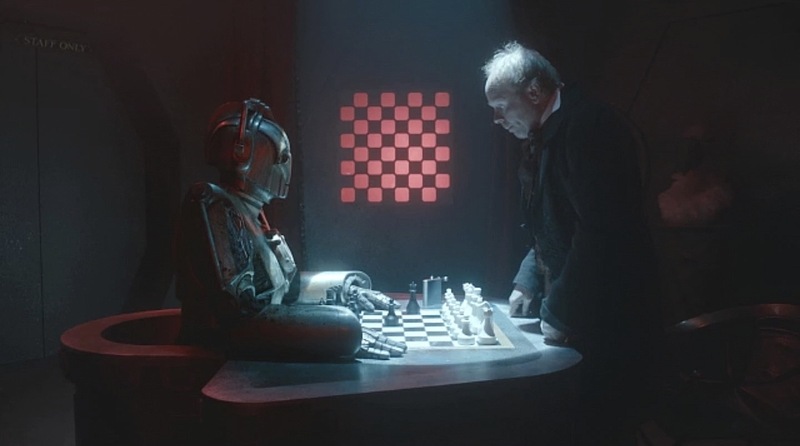 The chess-playing Cyberman, operated from within by remote control and the diminutive Porridge (a very effective Warwick Davis) is of course a reference to The Turk, that other elaborate chess-playing mechanical hoax of the 18th Century which concealed a human chess master inside to operate it. 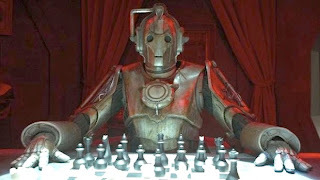 The deadly Cyberman sat at his chess board is symbolic of layers of concealment and trickery within the episode, a visual foreshadowing of the Doctor's fate. 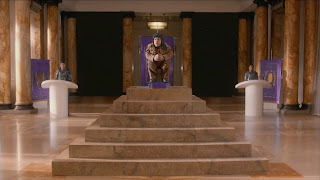 Porridge's identity as the reluctant Emperor, hiding away in plain sight from his duties at court, is analogous to the dormant Cyber army concealed on the planet, their intent tucked away behind the rusty old exhibits. Even the little Emperor has been mythologised, with the unassuming Porridge made taller and more regal in the form of a highly inaccurate waxwork and where an unflattering view of the royal family means 'you could end up on the run for the rest of your life'. Gaiman subtly has Angie put the clues together after she's given an Imperial penny and compares it to the waxwork. The freak show Cyberman conceals the cold logic of its survival beneath the public spectacle, symbolised in the metallic woodworm slithering their way through the exhibits and detected only by a much concerned Doctor. That concern translates into a sleepover for Artie and Angie in the shadowy interior of Webley's World of Wonders. Gaiman provides an example of child viewer identification taken to its extreme as their representatives try not to have nightmares in a dream space filled with inanimate and animate monsters. 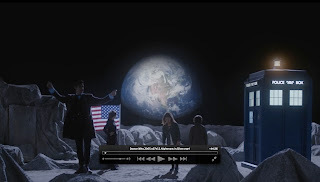 The Doctor becomes the parent by proxy telling the scary bedtime story, issuing warnings not to wander off and suggesting impossible rescues from subconscious fears and real dangers. Naturally, the brattish Angie ignores all to the contrary. Webley is infected by an infestation of those metallic insects and becomes the proud recipient of an upgrade courtesy of the chess-playing Cyberman in a suitably unsettling sequence which underlines the episode's focus on the struggle between flesh and machine, the logical and the emotional. 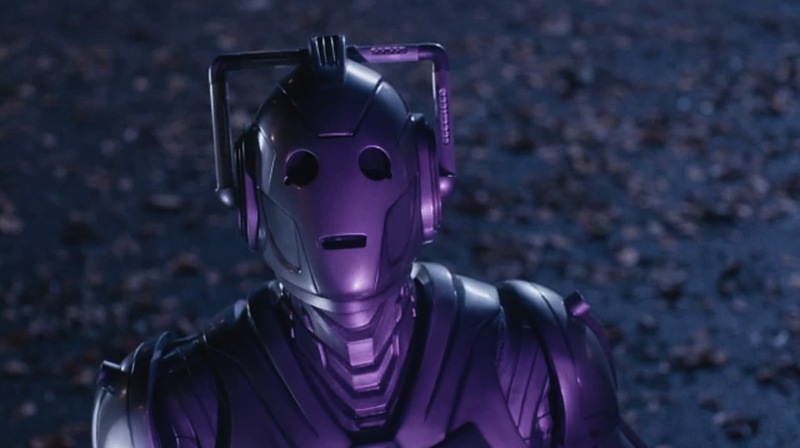 The upgrade ushers in a new look for the Cybermen, the latest in a long line of cosmetic changes, and one which returns to them something of their original appeal. 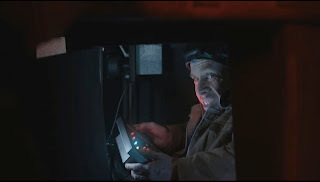 The rather clunky, flare-wearing Cybus-men are transformed into creatures akin to the 1960s Cybermen last seen in The Moonbase and The Tomb of the Cybermen. Gaiman apparently wanted the faces to capture the uncanniness of those he first saw back in his childhood and was also given a remit to make them scarier, an edict from Moffat who is often reluctant to reuse classic monsters unless they can be improved upon and given new qualities. 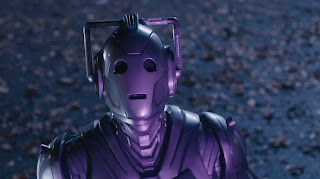 It's entirely possible there are now viewers who don't recognise the Cybus era Cybermen never mind their 1960s cousins and for whom all of this is entirely new. The relative age of the viewer establishes a tension whenever a classic monster is reintroduced into the series. Not only does Moffat's wariness come partly from a view of classic monsters lacking the ability to withstand the more sophisticated, contemporary tastes of a younger audience but also a concern about disappointing long-term fans with unflattering design decisions. That tension can result in a Dalek paradigm too far removed from the original iconic design and using gimmickry for its own sake. 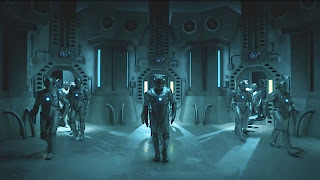 How far are the Cybermen moving away from their origins as posthuman horror show and an example of the dehumanisation inherent in replacing their bodies and brains with cybernetics? Here, Cybermen can remove their heads, spin them round or send their disembodied hands scuttling off after a victim. Will we see those abilities again in future episodes? Stealth is still not their strong point as they still sound like a kitchen full of exploding pots and pans when they stroll up behind you but, hey, that's modern monsters for you. Apart from their new outfits, the best thing Gaiman achieves is to make them super fast, scarily efficient at upgrading themselves and rapidly transforming their human victims. The Cybermites are also a very clever way of modernising the Cybermats and they become a form of invasive nanotechnology, literally the bugs in the system. The other positives here are the nods to the past - the return of the Cyber Planner (his previous machinations were last foiled on The Wheel in Space), the use of gold (the ticket had its uses) to temporarily thwart his conversion of the Doctor, an indirect mention for Marc Platt's excellent audio story Spare Parts and a very nostalgic visual allusion on the part of production designer Michael Pickwoad in the use of the ladder motifs from the sets of The Tomb of the Cybermen when the Cybermen are revived beneath the surface of Hedgewick's World. As an indomitable force they are second to none it seems when Porridge explains to Clara the moral dilemma behind their defeat in the Cyber Wars. To prevent a universe from succumbing to the Cyberiad you must sacrifice a billion, trillion innocent lives and to end a Cyber War you must be prepared to plunge the entire Tiberian spiral galaxy into darkness. It's a contemporary dilemma - do you become as ruthless and cold as your enemy in order to defeat them? As Porridge confesses 'I feel like a monster sometimes,' there is a subtle suggestion he was the 'poor blighter who had to press the button to blow it all up' and this is perhaps the reason why the Emperor is hiding away from the burden of his responsibilities. His philosophy also dovetails with the reason for the presence of the punishment platoon, a group of ineffectual soldier misfits led by a Captain (an underused Tamzin Outhwaite) who, it seems, refused to follow similar orders in the past. 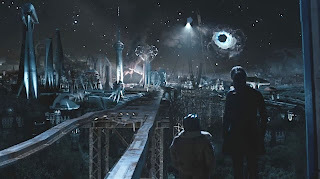 Beneath the super-slick upgrade of the Cybermen there are many core themes connected to Gaiman's vision. Gaiman invests plenty of mythological and fairy tale tropes into his work and in Nightmare in Silver he's exploring several ideas about the eighteenth and nineteenth century fascination for automata presented in side shows, museums and fairs, linked into the Hedgewick's World concept and the Dickensian character of Mr Webley, informing the discussion about the burdens of power and our fundamental fear of technology getting out of control. 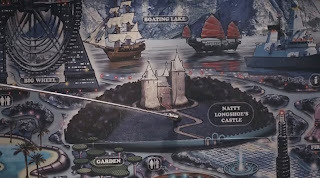 The final battle also takes place in a pretend fairy tale castle, Natty Longshoe's Comical castle ('real...but comical'), melding a Gothic sensibility with present day traumas about becoming posthuman. Porridge is symbolic of the renaissance ruler in disguise, a much used trope in myth and fairy tale, from Haroun al Raschid, the wandering Caliph of The Arabian Knights, to Henry V disguising himself to eavesdrop on his troops, and who attempts to understand the commoners. In the king's desire to be 'one of us', fairy tales explore the social function of the aristocrat and the nature of a flawed human being forced to make decisions which affect huge populations. 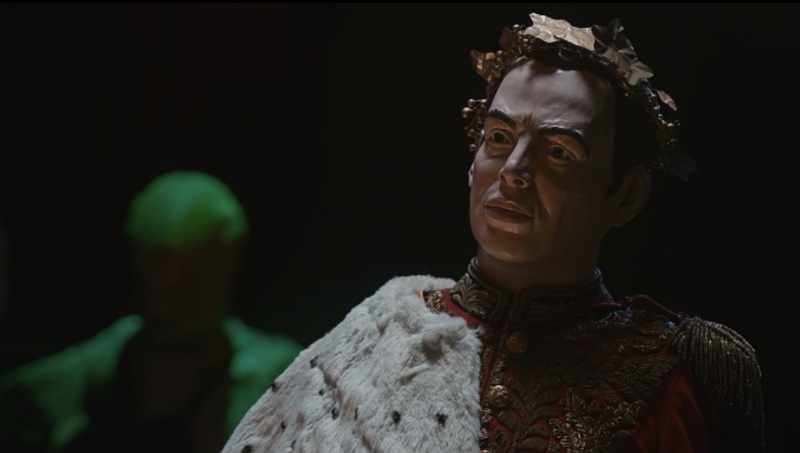 The reluctant Porridge seeks enlightenment away from the court and would rather conceal himself among other misfits as he also conceals himself beneath a puppet Cyberman, literally the power behind the throne rather than in front of it. The Turk, that chess-playing automaton hoax presented by Baron Wolfgang von Kempelen in the eighteenth century taps into our desire to be deceived by machines, our anxieties about the uncanny valley and fearing something so approximate to the human form which could turn against and eventually replace us. Gaiman's biggest influence, not just on this episode, but probably on his other material, is the work of E.T.A. Hoffman, particularly his tales 'Automata' and 'The Sandman'. The nightmarish Sandman figure in Hoffman's tale was also central to Freud's theory of the uncanny - the unheimlich - which has been a huge influence on the interpretation of the extraordinary lurking beneath the ordinary in horror, science fiction, myth and fairy tale. In Hoffman's 'The Sandman' a young man, Nathaniel, is engaged to a young woman, Clara (quite a coincidence), but is haunted by childhood memories of the sandman, a noctural creature who steals away children's eyes to feed to his own offspring. This trauma affects his relationship to such a degree he falls in love with an uncannily human automaton, Olympia. The understanding of childhood fears and the duality between man and monster, human and machine are written into Doctor Who's DNA and Gaiman forges connections with the earliest examples of Romantic and Gothic literature to explore the nature of humanity as it comes into contact with super-intelligent machines. The chess match analogy, symbolised by The Turk and its status as a trick, is continued further in the conversion of the Doctor by Cybermites. 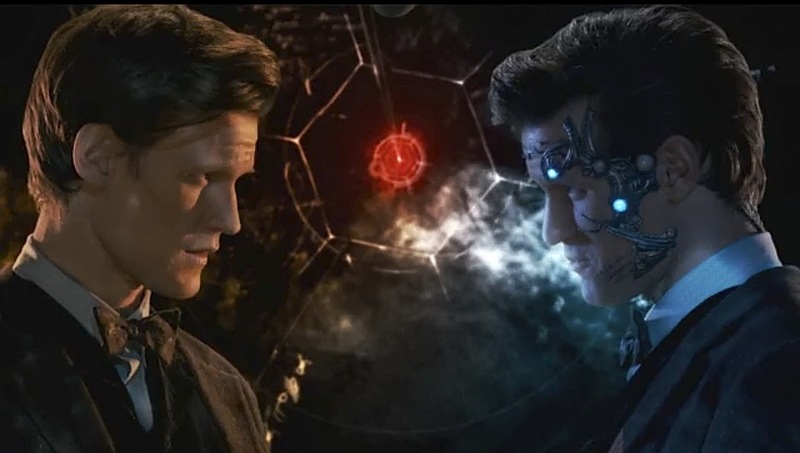 The Doctor/Cyber Planner tussle evokes humanity's troubled destiny as a posthuman cyber being, as flesh seamlessly merged with intelligent machine. It's chess master Kasparov being defeated by IBM's Deep Blue computer, itself the valediction of Turing's test for artificial intelligence, and the battle inside the Doctor's neurons is depicted as the Cyber Planner's narcissistic fantasy of perfection, a rifling through his innermost thoughts about Clara and a roll call of past Doctors. The portrayal of this dualism hinges entirely on Matt Smith convincing us he is both with his performance as he flips between Doctor and Cyber Planner, between The Turk automaton and his flesh and blood operator. The Doctor essentially fights his own doppelganger but where the Cyber alter-ego would presumably be cold, logical and personality-free Smith turns him into an emotive, angry creature only just shy of a pantomime villain. 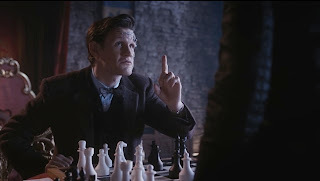 Fascinating as the themes are about a game of chess, as an empirical performance of intelligence, of machine reason against all human comers, wherein the Doctor cheats the game in three moves by 'taking advantage of the local resources' much as the Cybermen use their upgrades to rapidly overthrow human kind, Smith's performance doesn't feel right and prolonged scenes of him switching personality rather outstay their welcome. Even his fleeting impressions of Eccleston and Tennant (a quote from Moffat's own Turk-inspired The Girl in the Fireplace no less) don't do him or the episode any favours. However, there's an interesting moment where the Cyber Planner, discovering the Doctor's attempt to erase himself from history, claims the Doctor could be reconstructed by the hole he has left, by his own absence. Is Clara this absence? Is she a disaster recovery mechanism in waiting? The Cyberiad-era bomb is similarly 'taking advantage of the local resources' and becomes the ultimate chess move where you lose all the pieces but the board is still intact. The machine human interface theme gains an ironic twist in that the bomb is a machine which requires a human voice to activate it, to complete a devastatingly rational act of destruction. The idea you need to become the very evil you're fighting in order to destroy it is a powerful one but the underdeveloped characters, particularly Angie, Artie, the Captain, Porridge and the platoon members, don't earn our empathy and the moral dilemma, to use such a strategy to blow a planet up with all lives lost, lacks weight. Angie is a rather unsympathetic character and Artie has very little to do but I liked the interesting clash between Clara and Angie. 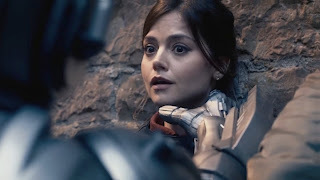 There is an emotional evolution for the humans in the story, a parallel to the Cybermen upgrading themselves, and we see Clara transformed into a leader just as Angie seems to have learned a bit of respect for her by the end of the story. 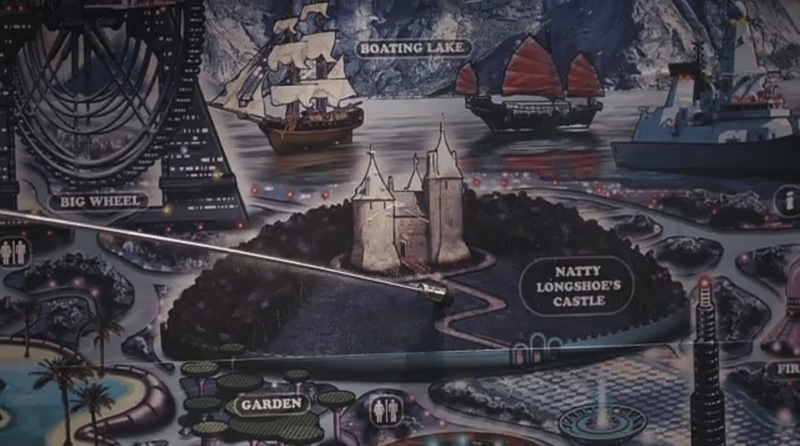 The presence of Artie and Angie may well be trying to say something about taking responsibility for those who are likely to be in constant peril, akin to the child-like innocence of Jamie and Victoria as opposed to the resourceful companions of the new series, but it feels rather intangible. The curious thing about Clara is her oscillation between fearlessness - almost the military machine as she gathers the troops and devises a strategy to see off three million Cybermen attempting to knock the castle doors down - and her obvious fear as seen in Cold War and Hide. Is this an inconsistency in the writing which comes out of Moffat's sidelining of a cohesive character arc to hold Series 7 together? His replacement of an overall arc with standalone 'movie event' style episodes, the losing of momentum by splitting the season and setting Clara up as a mystery may all be affecting our reception of these episodes. Once the mystery is solved, will there be enough of Clara, as a character, to retain our interest? Nightmare in Silver is frustrating and disappointing as there are a lot of very interesting ideas Gaiman gets to grapple with and yet there is nothing substantially cohesive binding them together. The Cybermen certainly look refreshed though his attempt to make them scarier spirals off into gimmickry. 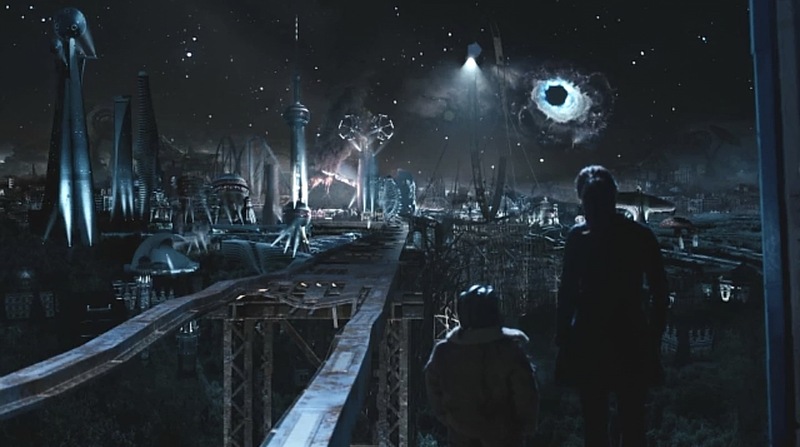 Three million Cybermen are defeated but it doesn't feel like a particularly climactic moment because it's a deserted planet which is destroyed and not an entire galaxy filled with millions and millions of inhabitants. 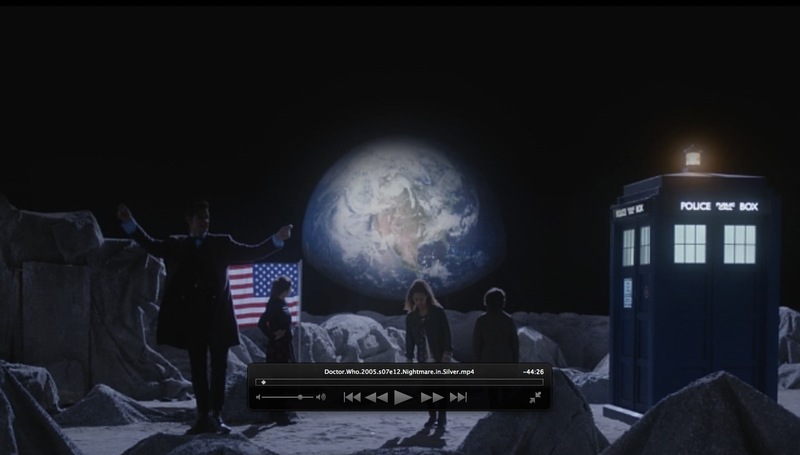 And three million Cybermen would have overwhelmed the castle in minutes. Porridge intimates it may have been his decision to destroy the Tiberian spiral galaxy but the burdens and loneliness of absolute power aren't made emotionally clear until the end of the episode. The big moral question is only partially addressed because the episode spends rather too much time watching Matt Smith attempt a performance so ambitious it defeats him. 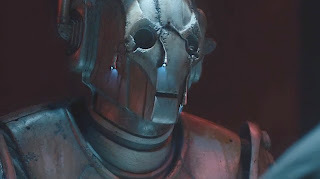 It promises much but unlike The Doctor's Wife, a story brimming with emotion and confidence, the irony is Nightmare in Silver feels almost as emotionally disconnected as the Cybermen it upgrades. 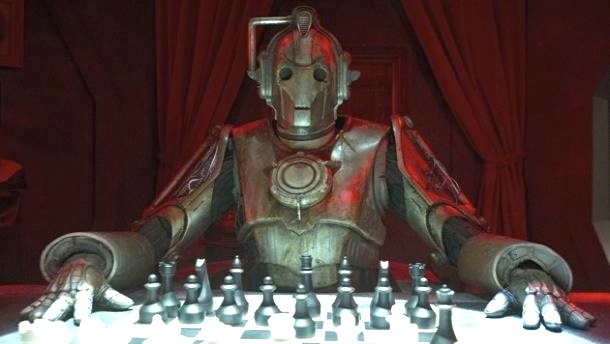 "The chess-playing Cyberman, operated from within by remote control and the diminutive Porridge (a very effective Warwick Davis) is of course a reference to The Turk, that other elaborate chess-playing mechanical hoax of the 18th Century which concealed a human chess master inside to operate it. " Much better realised as a cyberman in the Big Finish story "The Silver Turk". I agree that the story didn't deliver as much as I was hoping, but that's always going to be the way after something like "The Doctor's Wife". The idea of the chess playing turk being a machine intelligence as a bit of a scifi trope - the "Turk" pops up in The Sarah Connor Chronicles as a potential precursor to Skynet. I've always found it interesting that Chess is an intelligence test, one at which the Doctor habitually cheats (as he did in Curse of Fenric). 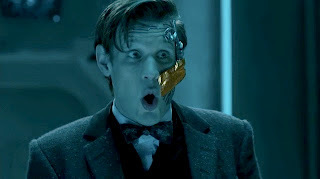 The improvement to the Cybermen was interesting. 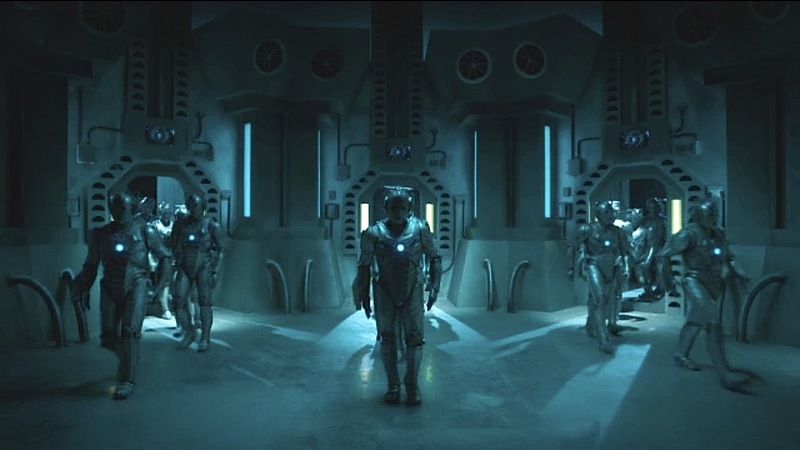 Even though the story borrows quite a lot from Dalek, it's good that the Cybermen have taken back the territory they lost to the Borg, and have become something potentially very modern - self replicating technology. Since they can now co-opt any life and use it to make more of themselves, they are effectively von Neuman machines. The idea of hostile nanotech is not new, but the sleeker design, the machine utility and speed are all welcome. The big mistake, though, is the idea of upgrading themselves to adapt to new threats. We saw this with the Borg; once you have an enemy that is immune to bullets and a massive threat, how do you stop them? So three million cybermen have to be destroyed otherwise that's a galaxy threatening force and how else can you deal with that in 45 minutes?